Starring Katherine Lynch (RTE's "Wagons Den"), Cheryl Fergison (EastEnders), Maureen Nolan (The Nolans) and Rebecca Wheatley (Casualty). 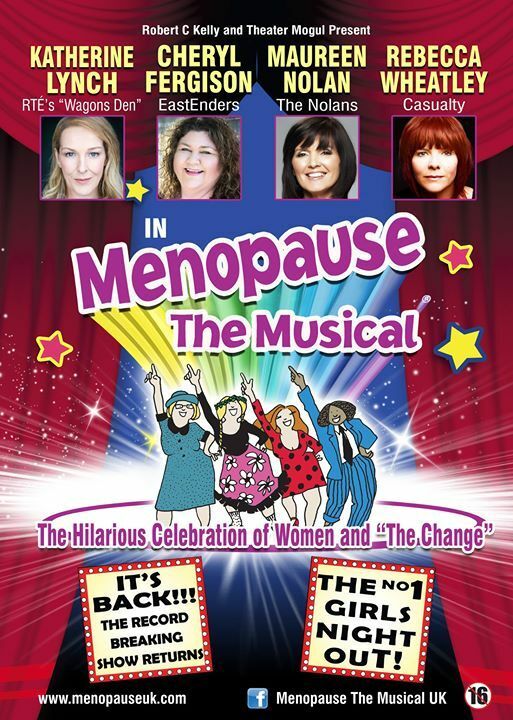 One of Ireland's favourite ladies night's out "Menopause the Musical" is coming for another Irish tour. This hysterical show packed full of one-liners about night sweats, hot flushes and memory loss is backed by an instantly recognisable soundtrack of innuendo-laden versions of 60s, 70s and 80s pop classics. An all-singing, all-dancing comedy set in a department store, where four women with seemingly nothing in common, meet by chance and make fun of their woeful lives experiencing "The Change". They soon bond as they realise that the menopause is no longer "The Silent Passage", but an unavoidable stage in every woman's life. The hysterical and uplifting Menopause The Musical will have you laughing, and singing, all the way home.